From the Ice Cream Museum to the Selfie Museum, L.A. has played home to Every. Pop-up. Ever. 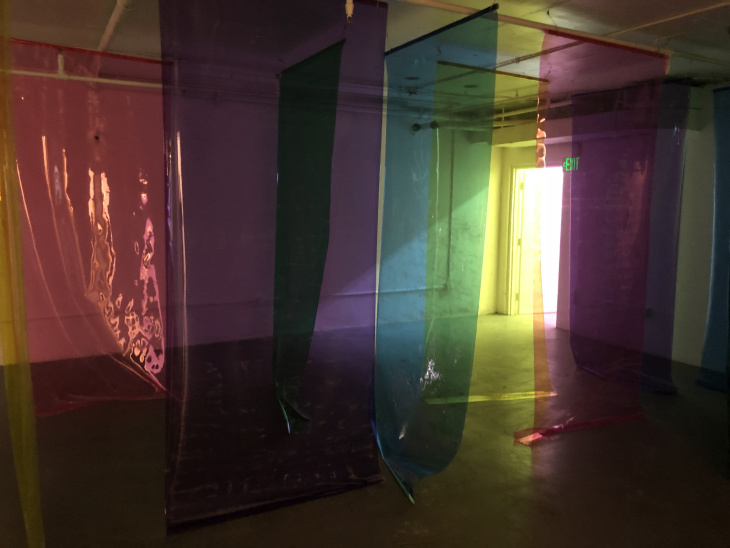 And starting Wednesday, the Egg House will join the noise, after previously appearing in both New York and Shanghai. 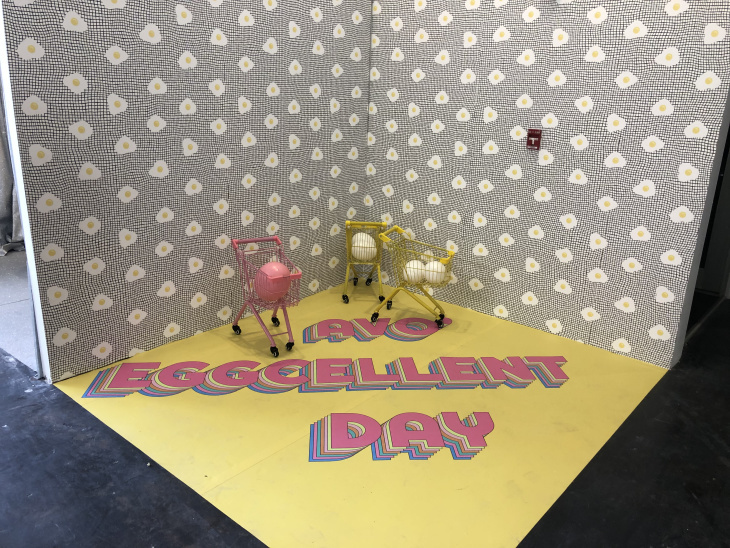 This eggshibition is eggsactly (sorry, not sorry) what it sounds like — a place to take a whole bunch of photos... with eggs. But why, you might ask, is this even a thing? "I'm kind of a brunch girl," said Biubiu Xu, founder of the Egg House. "Also, eggs have a lot of shapes — like fried egg, eggs benedict." 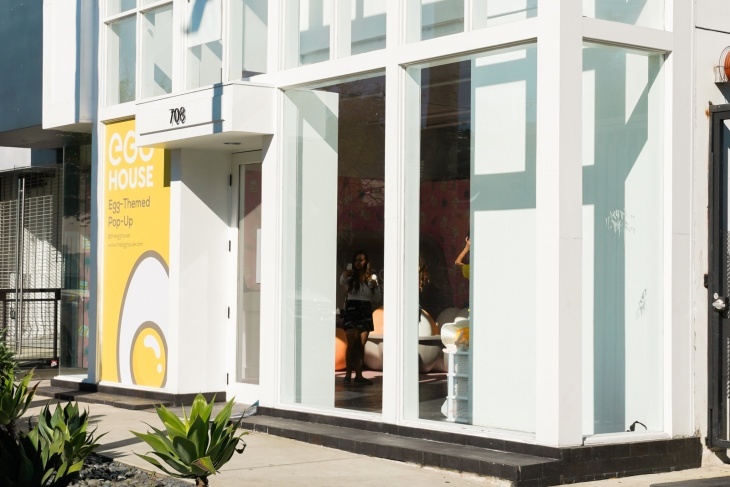 Xu, who recently graduated with a master's in accounting, founded the Egg House with the help of other recent graduates. She explained to LAist that she liked the idea of eggs because of all the possibilities that can fit under the banner of "eggs." The whole thing, organizers say, is supposed to be the dreams of an egg with visions of traveling through Los Angeles. So yeah... let's take a look at some of those egg dreams. 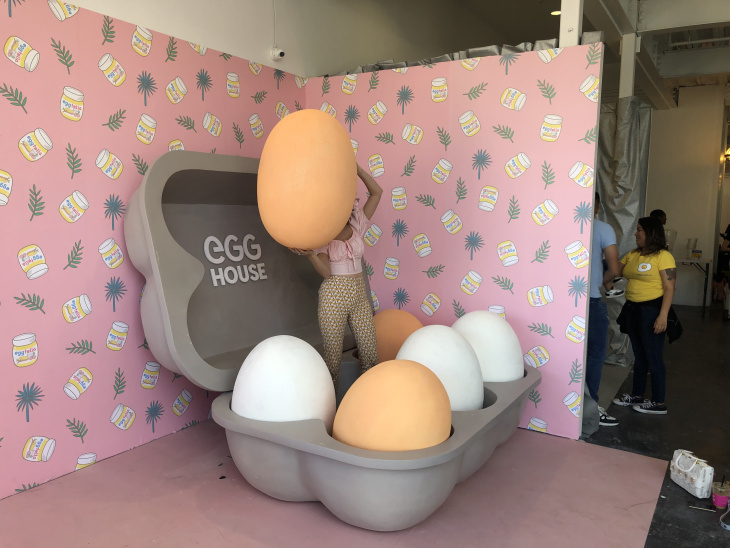 By the entrance, you'll find the Egg House's signature photo opportunity: a giant carton, as if you're Alice In Wonderland in a refrigerator, filled with monster eggs that you can hold up and interact with. 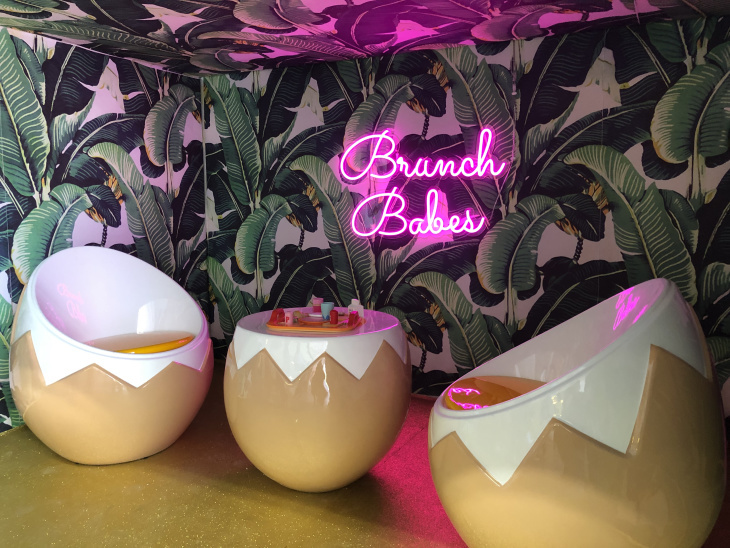 Across from the egg carton, there are a couple of egg-shaped chairs around a half-egg table with a sign reading "Brunch Babes." Cool — egg-themed pseudo-restaurant, makes sense! But venture deeper into the Egg House, and the connections become a little more tenuous. 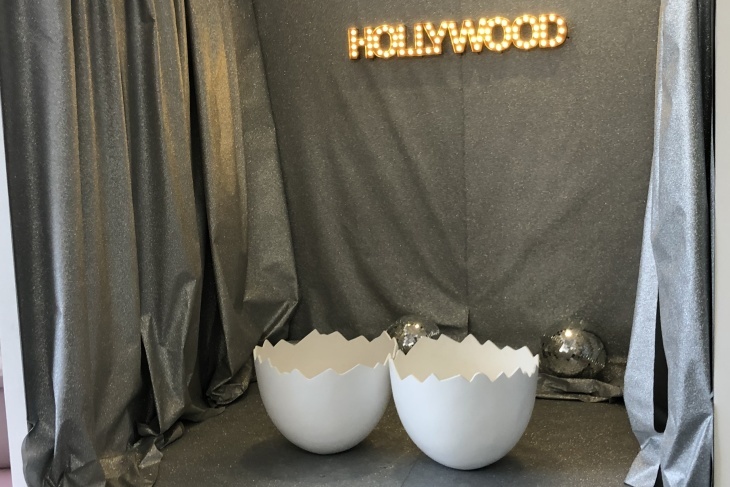 Like these egg chairs with a sign that says "Hollywood" behind them. That has to be the bare minimum amount of egg-ness, right? Not so much. Part of the thought behind this version of the Egg House was adding some local references, so you get some attempts to mash up (or should we say "scramble"?) eggs with L.A. culture. 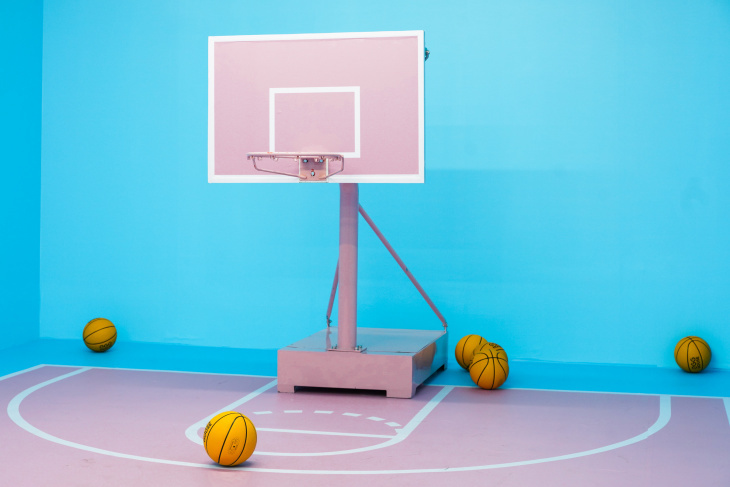 Hence, one of the most baffling backdrops in the entire pop-up: an Easter-colored basketball court. Inspired by Staples Center, the basketballs are colored yellow to imitate the yolk, we guess. It doesn't exactly scream eggs, but hey, it's a fun chance to play junior-sized B-ball. 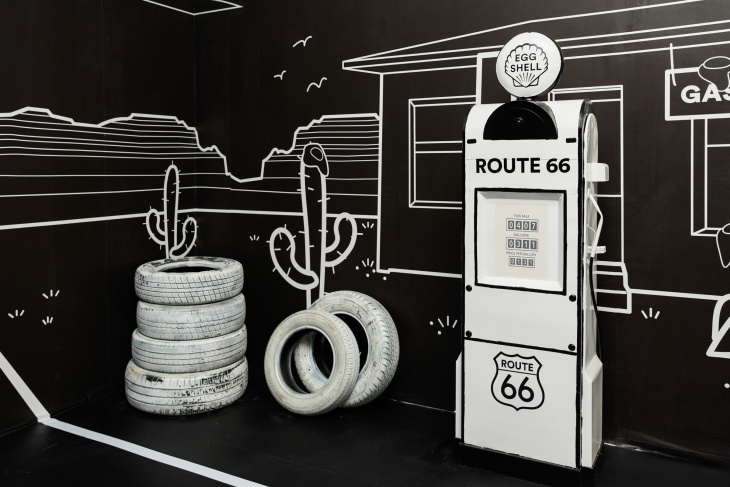 This Route 66-themed eggstallation is quite nice and cool looking, though we're not quite sure if changing "Shell" to "Egg Shell" is inspired or eggsasperating. 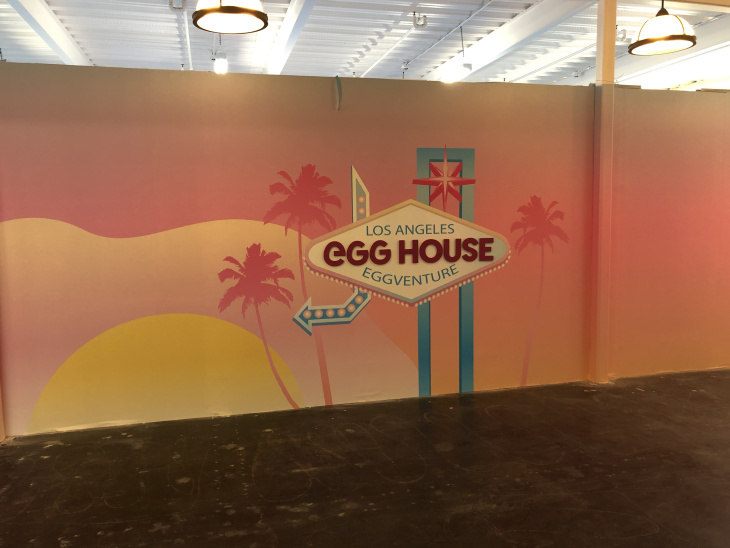 You'll find one Egg House backdrop styled like an old Vegas sign — sure. Close enough, feels southwest-y. It's not quite as great as [the non-vandalized version] of L.A.'s Pink Wall, but we're sure you can get some nice photos with the sunset-hued background. One big plus of the Egg House is its family-friendly feel. More than 70 percent of the audience was women at first, according to Xu, but they started to find that children were crazy about the subject matter. Now, the split is closer to 50/50 between women and children. 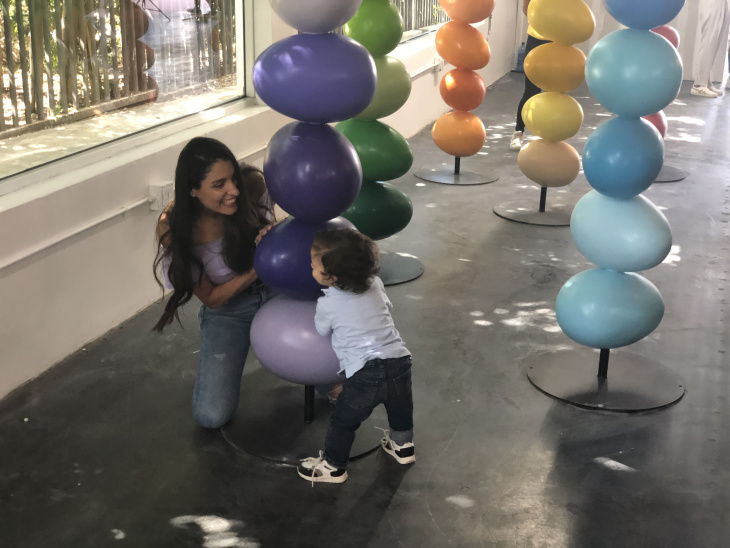 Kids are also probably the perfect audience, not jaded enough yet to be comparing one pop-up art installation to another — they're just going to enjoy pushing around those eggs in shopping carts and pushing past egg pillars. See evidence above. 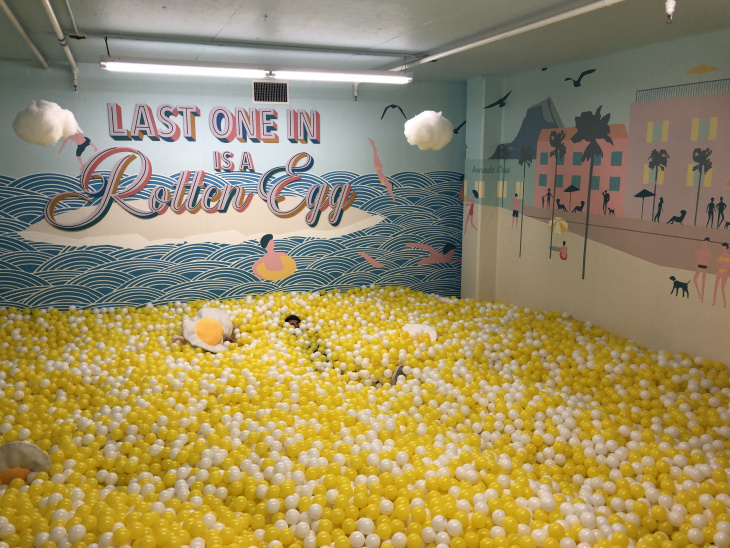 The two-story pop-up also features a downstairs area, whose signature attraction is a pop-up go-to: a ball pit. This one is inspired by the Santa Monica Pier, featuring lots of yellow and white balls, along with egg-themed pillows. Finally, there's this — the moment when I questioned everything I knew about Instagrammable pop-ups. Did the egg that dreamed up this whole thing run out of ideas? Or did it just start eggnoring the theme? 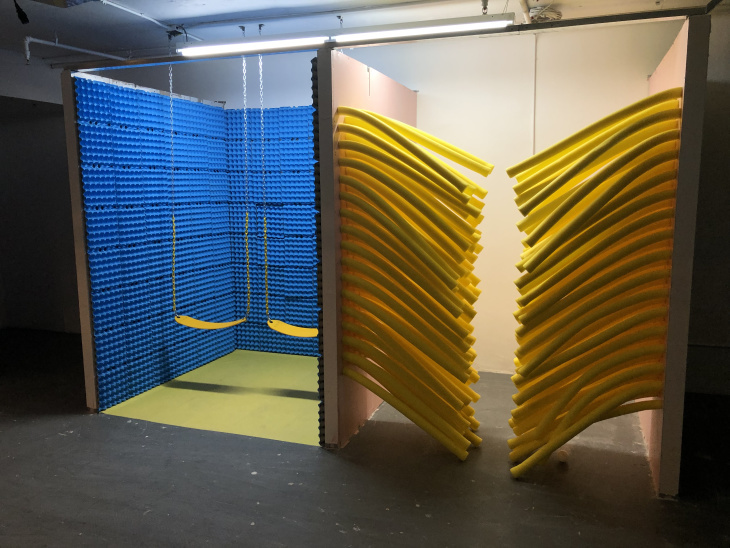 I mean, I guess those swings and pool noodles are egg-colored? And there's some egg-crate foam padding? What do you think? And then, I saw this. I think this was just part of the venue, not something created for the Egg House, but really, I have no idea.